MTM01 Digital Multimeter Including AC/DC Voltage, AC/DC Current, Resistance. 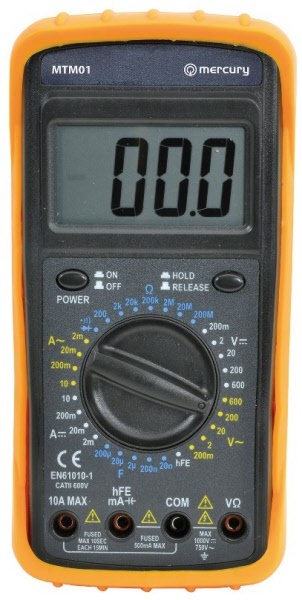 Large 3½ Digit LCD, Automatic Polarity Indicator, Continuity Buzzer, Capacitance, Diode and HFE Test, AC and DC voltage up to 600V, resistance up to 2Mohm, AC and DC Current up to 10A, Data-hold function and backlight. Supplied with shrouded test leads and shock proof rubber holster.